Rich, buttery. We use avocado oil in our pre-wash hair treatment to delivery essential moisture while olive and almond oil. Rosemary and Nettle extract help give your hair a beautifully glossy shine. First off: If you have fine hair or no issues with dryness, this product is not intended for you. This is a very hydrating product, it contains olive oil and sweet almond oil in addition to the advertised avocado oil, so if your hair is already flat, fine, or moisturized, look elsewhere for something to make your hair shiny, as this will make such hair types oily instead of shiny. When I first heard about it, I thought the avocado and olive oil would be wonderful for me because my hair is dry but I was disappointed. It was difficult to work through my hair and felt greasy. It did not leave the silky feel that I have come to expect from treatment products. In fact, it felt tacky and difficult to rinse. The only thing I like is the apricot scent. I think this maybe will work for a very dry, coarse, frizzy hair. 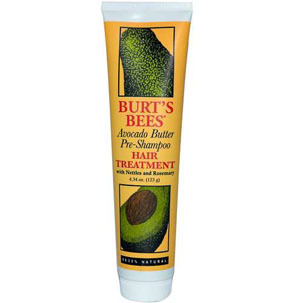 I like Burt's Bees skin care products but I don't will purchase this hair treatment again.